In a recent blog, we introduced a few of the trailblazers to enterprise social networking, including Yammer, Socialcast, and Signals. This column covers another early space-shaper, Jive, as well as three of the enterprise entrants, Salesforce.com, Cisco and SAP. Jive Engage Platform combines community software, collaboration software, social networking software, and social media monitoring tools into an integrated platform. The product includes user profiles, blogs, wikis, discussion tools, video, analytics, and social media monitoring. Jive Engage Platform is designed to work for internal and external communities, and has been customized by major enterprises to drive interactive customer portals on their websites. Jive offers integration with enterprise applications such as Microsoft SharePoint, and provides enterprise controls including privacy, security, and permissioning. Upside Take: Jive Engage Platform seeks to be the social networking platform for the enterprise, connecting external and internal communities together in one unified, protected place. Its goal is to replace email and legacy applications and be the center of enterprise collaboration, community, and productivity. Jive’s close integration with Microsoft SharePoint illustrates the approach Jive has chosen with regards to bringing enterprise apps into its environment so that enterprise users can “live” in Jive. In August, the company announced its intent to file for an IPO. Salesforce.com has made a strong enterprise social media entrance with Chatter. 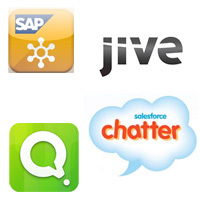 Chatter provides a cloud-based, social networking suite of tools for enterprises. It includes many of the common social networking tools, such as user profiles, status updates, activity feeds, and file sharing. Chatter leverages Salesforce.com’s secure, cloud-based network to ensure privacy. There are several versions of Chatter, from a free Chatter.com to an enterprise version that offers additional features including event management, task management, reporting and dashboards, workflow, and integration with applications. Salesforce’s recent acquisition of Dimdim will add communications capabilities like screen sharing, presence, and instant messaging. Upside Take: Chatter was one of the early players in the enterprise social networking space, and has the largest reported user base, with more than 80,000 Salesforce customers using the product. It essentially serves as a Facebook for the enterprise, with a greater focus on the social media tools than some of the enterprise platform vendors. Quad takes all of the communication tools Cisco has acquired (e.g. WebEx and Jabber) and combines them with social networking tools to provide an enterprise platform for unified communication. Quad is based on a solid communication foundation with enterprise-level policy controls and management, bringing together social content, social media, and unified communications. It includes all of the standard social networking tools including micro blogging, content management, activity streaming, integration with external social media sites, and a blog aggregator. It supports the contact and follow models of interaction. Tools like Social Miner (ability to mine social behavior related to user profiles) and Show and Share (video sharing portal) reflect the native web-based nature of Quad. Quad uses triple-store technology to fully support social graph capabilities. Upside Take: Cisco positions Quad as a platform that supports the Integrated Workforce Experience (IWE), which is a transformed way of working, based on collaborative communities created around job and organizational roles and topics of interests. The goal of Quad is to combine social networking with unified communications, existing enterprise applications to provide users with a rich, multi-layered environment for collaboration and productivity. As we covered in a recent blog, Cisco’s recent acquisition of Versly plays into its grand plans of having a Unified Communication platform. Versly is still in its infancy (it has several hundred beta users of its solution), but the context-based technology it brings to the table fills a hole in Cisco’s unified communication platform vision. The plan is to integrate Versly software with existing Cisco collaboration solutions including Cisco Quad, Cisco Jabber, and Cisco WebEx. SAP’s StreamWork is designed to answer a very common challenge with enterprise business processes: how to capture, integrate, and leverage the ad-hoc aspects of collaboration around a business process. StreamWork is ideal for groups of 5-30 people working on a cross-functional project together. It can integrate enterprise applications into the project space, and document all of the interactions among project members throughout. StreamWork provides a cloud-based version for end users to link customers, partners, and collaborate. This can then be tied to the Enterprise edition of StreamWork behind the firewall with all of the requisite levels of enterprise security and management. Among the tools included are status updates, information feeds, activity management, and time management. StreamWork integrates with a number of collaboration and content management tools, including ScribD, iChart, and Box.net. Upside Take: SAP does not intend StreamWork to become a productivity suite, replicating many of the applications that exist in the enterprise. Rather, SAP’s approach is to provide an open framework for connecting with those productivity applications that exist in the enterprise. Those applications remain the repository for files of record. They are simply pulled into StreamWork for the purpose of a specific project or point in a process. The goal of StreamWork is very goal-driven project and process management rather than collaboration platform, an important distinction from other solutions in this space. As these examples suggest, there are more than one way to peel the social networking banana. Understanding how each vendor approaches social networking within the context of the enterprise computing environment is an important step toward selecting the best fit for your company. In the third part of this series, we will look closer at some of the enterprise vendors’ approaches to adding social networking to their platforms, including Oracle, IBM, and TIBCO.